Well it has been one of those days. I started working with royal icing this morning and the phone rings. Royal icing drys rock hard and is wonderful, except when you have to answer those crisis calls. You have to drop everything and drive over the forgotten item. You know those days I'm sure- we have all had them. 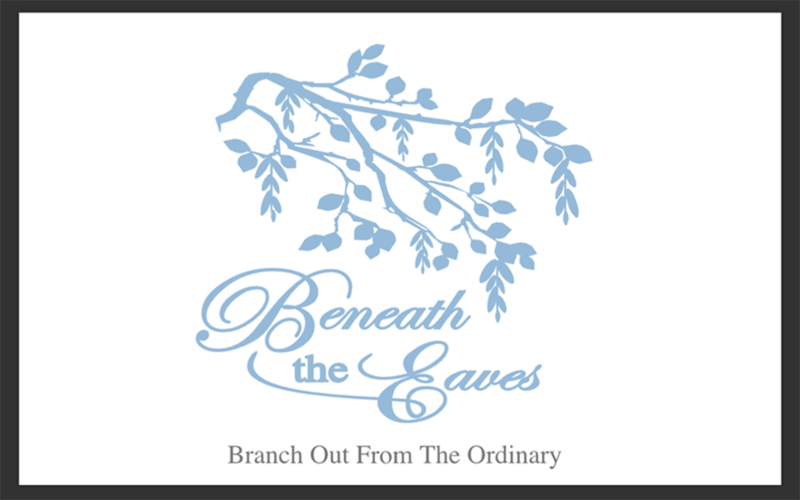 Your plans just take a nose dive. I told my husband I am adding 24 hour crisis manager to my resume'. The only blessing. Nothing is perfect in nature, so working on creating birds was truly a blessing. At least it wasn't something more fussy. Some of the nests are a little askew, but they still came out great. My children and I have made these type of sugar cubes for Christmas. We created tea trays for each member of the family for their present. 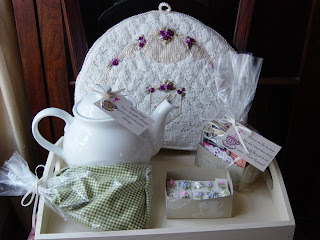 We made custom made tea cozies, decorated sugar cubes, hand stamped boxes of tea, spice bag, painted tray, and a tea pot. The children loved hand stamping, working with the icing, and finding sayings to add to the items in the gift. First make sure you choose the sugar tablets and not the sugar cube dots. Although you can decorate the dots, they are smaller and harder to work with. Create royal icing according to the directions. It is very easy. 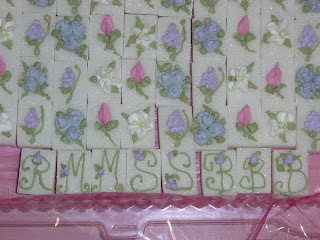 Only a pound of confectioner's sugar was needed to decorate a whole box of tablet sugar cubes. These were the tips I used for the decorating today. Using the green icing and the #67 tip the leaves were created in the following manner. Starting in the center of the sugar cube use slight pressure and release as you pull to the tip of the leaf. Make a triangle pattern with your leaves to create a base for the nest to sit on. Using the brown icing and the #3 tip place a small brown dot in the center of the leaves. Start building the nests by adding a strand of brown icing around the dot in a clockwise manner increasing the size as you go. Using the #2 tip and blue icing, add three little dots for the eggs. Let them dry and that's it. You have customized your cubes. one uses them before the shower....I don't think I can take another crisis today. In the next blog I will be making cake and dessert stands with glass lamp shades. Those are so beautiful and you make it look so easy! Hope everything settles a little for you. I can't even imagine what you must be going through. Remember to take care of yourself too!